One of the first projects I planned on my property was a Woodland Garden, having succumbed to their lure a few years before. Shade, ferns, cool walks on a pine needle carpeted path next to a babbling brook, flowering trees and shrubs in the dappled sunlight, communing with the earth in its natural state. Just a little enhanced. And a little cleaned up, and, a little prettier. Also I believed they would be easier to plant and maintain than herbaceous borders or formal hedged garden rooms, which I admired, but found intimidating to start. I was a big fan of the woodland gardens at Winterthur and the Yaddo. Woodland Garden at WinterthurCloser to home, afternoons meandering through the flowering shade-loving plants at Clermont and the rustic fences and benches at Olana provided inspiration. At the time we bought the property, about 5 acres of open land had reverted back to a somewhat scrubby wooded state. One particular area , roughly an acre in size, contained a thick stand of elm trees and locusts, some rocky outcroppings, and gradually sloped unevenly towards the towards the road along the lawn on the south side of the house. This was the spot for my woodland garden, I decided without hesitation. “I just wanted to let you know. You stay away from our property, we stay away from yours and we’ll all get along just fine”. Our blank stares seemed to stoke his mild agitation into something approaching mania. “YOU DON’T F**K WITH ME AND I WON’T F**K WITH YOU! We nodded our heads vociferously and hoped dark stains were not becoming visible on the crotch of our pants. “CHRIST!”, he exclaimed as he looked at his forearm. We jumped. “Oh yes!” we replied, relieved to be alive. “Maybe I will have you over for a beer soon”. “By the way, you have any on you now?” I trotted of to the kitchen, bringing him back one, handed it to him and jumped back out of arm’s reaach. “Thanks guys, nice to meet ya” He took two swigs, gave a quick nod, and disappeared back into the brush. I decided then the first order of business would be to plant some fast growing arborvitae in the brush behind his cottage, and then run, fast. That way as I cleared out the woods a bit closer to the property line, what little view he had would be soon be obscured by an impenetrable hedge, which should make him happy. If not, I decided to carry a couple of cans of beer when gardening close to the no mans land between us, to toss his way in case he charged. I ordered five arborvitae from one of my catalogs. The package duly arrived later that fall. They were roughly 2 feet tall each, and after being stealthily planted behind his cottage, didn’t seem to make any difference at all. Still they were supposed to grow at least three feet a year, and I had high hopes for their future, which in turn might save my life. That winter I started planning my Eden – a winding path outlined with a twig border, different types of fern amongst the rocks, Russian forget-me-nots, a bluebell dell. 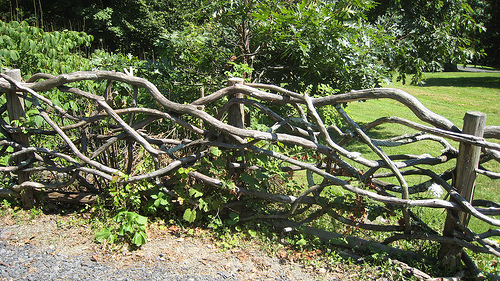 Along either side of the path entrance I would construct a wooden rustic fence, similar to one at Olana. Rustic fence at OlanaSpring came and I was raring to go. The arborvitae didn’t seem to have changed any from when I planted them, but at least they were all still alive. I found an open spot and planted bluebells. I bought and planted a dozen different varieties of fern - cinnamon fern, ostrich fern, woodland, maidenhair, and japanese painted to name a few, carefully diagramming their placement on a sheet of graph paper in their latin names. I stuck posts near the edge of the lawn in front of the trees to be the base on which to begin weaving my intricate rustic fence. I attacked the project with gusto, removing dead limbs from the ground and pulling up unwanted plants. And began to outline the edges of the path with smaller branches and twigs. However, each weekend I returned to my woods, new unwanted plants kept popping up, and it seemed just as many branches and twigs had fallen off the trees as I had taken up the weekend before. I had no pine needles to carpet my path with, conifers being in short supply on my property, so I cheated and bought 6 bags of pinebark mulch to lay between the twig borders. The six bags covered the path – for about 4 feet. I switched to dead leaves. Weaving the rustic fence proved problematic. Small gnarled branches would split or shatter when I attempted to attach them to the posts. I did manage to find an old length of grapevine to nail from the top of one post to another, figuring I would add more as I found them. The process of tidying up and enhancing nature was beginning to overwhelm me. I needed assistance, naturally turning to those closest to me. My then partner Joel was the first to help. He was also the first to quit. I recruited him to help me clean up the section of the woods closest to the road. We were picking up dead branches and limbs when a car slowed down to observe us, coming almost to a dead stop. Odd, I thought, and turn to Joel to say so. Joel let out a small yelp has he stood in a weird contorted pose, his right leg appearing to have been swallowed by the ground up to his knee. “How embarrassing”, I thought, “No wonder that car full of people were staring”. The befuddled look on his face gave way to disgust as he pulled his leg up, revealing it to be we up to the knee. “What luck” I countered enthusiastically – we can stick a pump in it and have a burbling brook to run down the slope. “You might have lost a sneaker, but we gained a water feature”. We bent over the hole to examine closer, but quickly drew our heads back from the distinctly septic smell emanating from the dark hole. On second thought, maybe better to have a new cover or cap made for whatever it was down there. That was the end of Joel’s assistance. My mother and brother were my next helpers to come and go. Having decided that since the rustic fence might not be the showstopper I envisioned originally, I wanted to plant some things in front of it to and create a nice little transition area between the woods and lawn. The two of them were down one Sunday in early May and offered to help me clear the ground n front of the posts. We pulled up new grass, and tiny saplings, grapevine, and also some strange vine-like roots running right below the soil’s surface. There were a lot of them – but we got them all out. It was a warm day, and I would stop periodically to wipe the sweat from my brows with our sleeve. At the end of the afternoon there was a nice clean patch of earth ready to be planted the next weekend. I returned to the city that night happy that I was making headway. At the office the next morning, I began to feel a little itchy, but otherwise fine. My assistant came in and looked at me, eyes wide. “Um, maybe you should go to the bathroom” he replied. I walked into the men’s room. Looking in the mirror, I saw someone who resembled me, but with red lines running across half of his face, like he had slept with a red sharpie. I looked down and rolled up my sleeves. They were popping up on my arms as well. Uh oh. They seemed to grow by the minute and I hastily left work, scheduled an emergency visit to my doctor and returned home. By late afternoon the lines and red spots had progressed to a full blown dermatological Hiroshima. My doctor explained that I had a severe case of poison ivy most likely, gave me a shot and some ointment. I returned home, hoping against hope that perhaps my mother and brother were spared. The frantic phone calls over the next 24 hours confirmed the worst. I decided to take a break from the woodland garden for a couple of weeks until my case of poison ivy was gone. With everything else that needed to be done around the house, and my newfound reluctance to enter the woods, the hiatus stretched to the end of that year. I decided to rededicate myself the woodland garden late the following spring. Armed with Roundup that I liberally applied to anything closely resembling poison ivy, I ventured back into the woods to reclaim my garden. The problem was – I couldn’t find it. There were no English bluebells to be found in their dell, which was appropriate I suppose, since I really didn’t know what a dell was to begin with. The Russian Forget-me-nots forgot to come back up, and the ferns, which I thought were supposed to relatively hardy, had all but disappeared. It didn’t help that their meticulously recorded planting plan was not drawn to scale. Really all that was left was a few feet of the path I had started and one lone rustic fencepost. Where did everything go? I had the “Lost Colony of Woodland gardens” on my hands! I decided that perhaps, in this little corner of the property, nature wasn’t ready for my enhancements yet. I dug up the few surviving ferns and brought them out to the edge of the lawn that we had cleared of poison ivy the year before. That fall I planted 50 daffodil bulbs on the edge of the woods to brighten things up a bit. The following spring, they actually came up and flowered. I was happy with that, for the time being.